Needle Decompression. It was drilled into you in school over and over. Anytime the topic of pneumothorax came up needle decompression was mentioned. Don't wait for the CXR if you suspect tension. Go 2nd intercostal space midclavicular line (2ICS MCL). This is something I've only had to do a handful of times in practice. It is one of the most satisfying things to do in a code when you suspect tension and to get sudden ROSC. Your riding on cloud nine the rest of the week! Now that I've become more aware of what happens at the hospital system level these seems to come in waves and we've had a wave recently. Anytime you hear about these not working you have to wonder. Did the patient not have a PTX or did it not work for some other reason? I was reminded of some #FOAMed posts over the years in several blogs mentioning that perhaps 2ICS MCL isn't the best space to go for needle decompression. When I mentioned this in practice it's clear these small studies haven't made it much beyond the #FOAMed community so I thought it was time to make our own post about it. I will be borrowing heavily from several great #FOAM resources so please check out their posts below for more details. It’s important to remember that current ATLS guidelines still recommend using a 5 cm angiocatheter in the 2ICS MCL. WHY WOULD 2ICS MCL NOT WORK? What is a site alternative? In America, our patients BMI continues to rise. We traditionally think 2ICS MCL is a space with the pleura close to the skin but that’s not the case. Obesity certainly plays a role, but muscular patients also can have a lot of muscle tissue in this area. Which needle is most readily available? In my ICU, it’s typically the medication needles that are frequently used to draw up medications. However, it’s important to know that these aren’t 5 cm in length. You can specifically request a 5 cm length 18G IV needle, but in my experience, these can be hard to find quickly due to their infrequent use. It can several minutes of someone searching in the supply closet to locate one of these. What are your other options? I’ve seen people rip open a central line kit which is an expensive, albeit quick option. They make needle decompression kits which typically have the 5 cm angiocath you are looking for. Some also include a Heimlich valve which is less necessary but nice to have. Could we just use a longer needle? A meta-analysis by Clemency was published in Prehospital and Disaster Medicine in 2015 looking at angiocath length for decompression and found the ideal length to be 6.4 cm at 2ICS MCL for a 95% success rate.2 They do make 8 cm angiocath’s which could be used for this purpose. However, there are some trauma papers showing increased risk of injury rate with 8 cm angiocaths. There have been at least two studies looking at ability to find the 2ICS MCL one in Emergency physicians3 and one in US Navy Corpsman4. In both studies, the 2ICS MCL was found with less reliability than the 4-5ICS AAL. Should I change my practice? Like most things in medicine, you wouldn’t be faulted to continue doing your current practice based on our existing evidence. These are meta-analysis of CT scans and cadavers not NEJM or JAMA multi-year RCT’s. However, those types of papers for a niche topic like this are never going to exist. You also wouldn’t be wrong to change your practice to 4-5ICS AAL as first line based on this data. At the very least, I’m going to get good at identifying the 4-5ICS AAL as well as work at getting better on identifying the 2ICS MCL. I will make sure I’m using at least a 5 cm catheter (not the short medication needles) and potentially switch sites if I’m not seeing the results I expect to see. 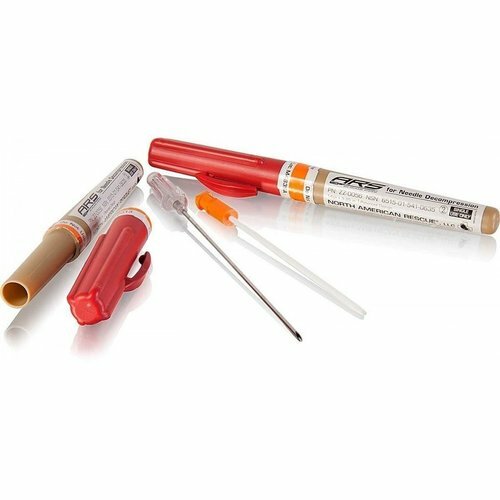 At our hospital system, we are working to ensure there are needle decompression kits readily available in the ICU’s as well as on the code carts. If I have a particularly obese or muscular patient, I may skip straight to 5ICS AAL. Bringing awareness to this issue could help a provider in a critical situation when you only have a few seconds to determine which site to use. We’d love to hear from you! Have you switched your practice after reading these articles over the last few years and hearing about it in #FOAMed? Clemency BM et al. Sufficient Catheter Length for Pneumothorax Needle Decompression: A Meta-Analysis. Prehosp Disaster Med 2015; 30: 249 – 53. Ferrie EP, Collum N, McGovern S. The right place in the right space? Awareness of site for needle thoracocentesis. Emerg Med J. 2005;22(11):788–789. Inaba K, Karamanos E, Skiada D, et al. Cadaveric comparison of the optimal site for needle decompression of tension pneumothorax by prehospital care providers. Wax DB. Radiologic Assessment of Potential Sites of Needle Decompression of a Tension Pneumothorax at the Front? Mil Med 2014; 179: 783 – 6. Chang SJ et al. Evaluation of 8.0-cm Needle at the Fourth Anterior Axillary Line for Needle Chest Decompression of Tension Pneumothorax. J Trauma Acute Care Surg 2014; 76: 1029 – 34.